The toll from an earthquake that rocked the Japanese island of Hokkaido has risen to 18, and two dozen people are missing in one small town after an entire mountainside collapsed on their homes. The region is slowly restoring transport links and power, with lights back in about half of the homes on the island after a day of blackouts. Officials said they hoped to have generating capacity close to normal by the weekend, though full repairs to Hokkaido’s main power plant could take up to a week. Rescuers are using search dogs, diggers and shovels as they dig through tons of mud and debris from the landslides triggered by the magnitude 6.7 quake that struck before dawn on Thursday. After more than a day of digging there were no reports of survivors being pulled from their crushed homes on the outskirts of the town of Atsuma, not far from the quake’s epicentre. There were scant signs of damage inside Atsuma itself, a seaside community of about 4,600 that advertises itself as a destination for surfing and a great lifestyle, but by late Friday, the power had not been restored and stores were closed. Farther inland, unharvested rice fields stretched before a long expanse of hillside that had collapsed all at once, bringing earth and timber down on homes tucked along the edge of the mountain. In the regional capital Sapporo, lights and water were restored to many areas a day after the island saw power cut off. Bullet train services resumed and the city’s airport at Chitose reopened. Some parts of the city were severely damaged, with houses tilting and roads crumbled or sunken. A mudslide left several cars half buried, and the ground subsided in some areas, leaving drainpipes and manhole covers protruding by more than a meter in some places. “We’re trying to do it faster, but it will likely take a week,” Mr Seko said. He urged residents to conserve power. 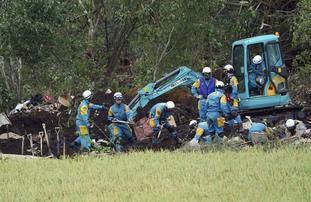 Japan has had a string of natural disasters in recent months. The quake came on the heels of a typhoon that triggered major flooding in western Japan, and damaged the main airport near Osaka and Kobe. The summer also brought devastating floods and landslides from torrential rains in Hiroshima and deadly hot temperatures across the country.